The “sniff down”, that is what I call it when my dog Bruiser gives me a thorough smelling after returning home. It is not surprising that he should want to smell me with all the different dog smells I bring from work, but I bet most of your dogs do the same when you return home as well. It is no secret that dogs have an amazing sense of smell, we humans have been using this to our advantage. We have taught dogs to search for missing people, bed bugs, and even smelling out cancer. Dognition shared a video through their recent blog All About Dog Noses that tells the story of Max who found cancer on his owner that regular testing missed. What’s incredible about Max’s story is that he was never trained to detect cancer, and his owner only knew because of Max’s extreme behavior change. 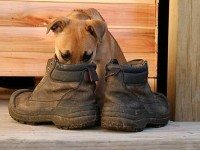 In this same blog Dognition states that, “a dog’s olfactory part of the brain is 40x larger than a human’s,” so it shouldn’t come as too much surprise that dogs smell things that we can only imagine. Knowing the power your dog holds with his nose may change how you interact with him. improve your mental stimulation activities with your dog. Simply allowing your dog extra time and freedom to smell on your daily walks will result in a more tired and satisfied dog in less time. It will be an even better experience if you take your dog to a completely new environment where he can find entirely new scents. good. I am not suggesting everyone teach their dogs to sniff out cancer (wouldn’t that be great! ), instead show your pup how to play games using his nose and you will both be happier. Teaching a dog to find his toys that you’ve hidden around the house and searching for hidden treats and food is an easy way to stimulate the olfactory part of the brain. You will quickly learn how satisfying and tiring this is for your dogs. Think of your dog’s sense of smell like an athlete’s natural talent; wouldn’t it be a shame for that athlete not to train and practice that ability even if it is just for fun? Do your dog a favor, respect his super smelling talents; even if that means standing an extra 5 minutes while they smell that bush for the 5th time.